You are here: Home › Cover Crop Benefits › Cover Crops effect on spring Soil temperatures › Cover Crop Challenges › Misinformation and Myths › Part 2- Do Cover Crops Keep the Soil Colder in the Spring? 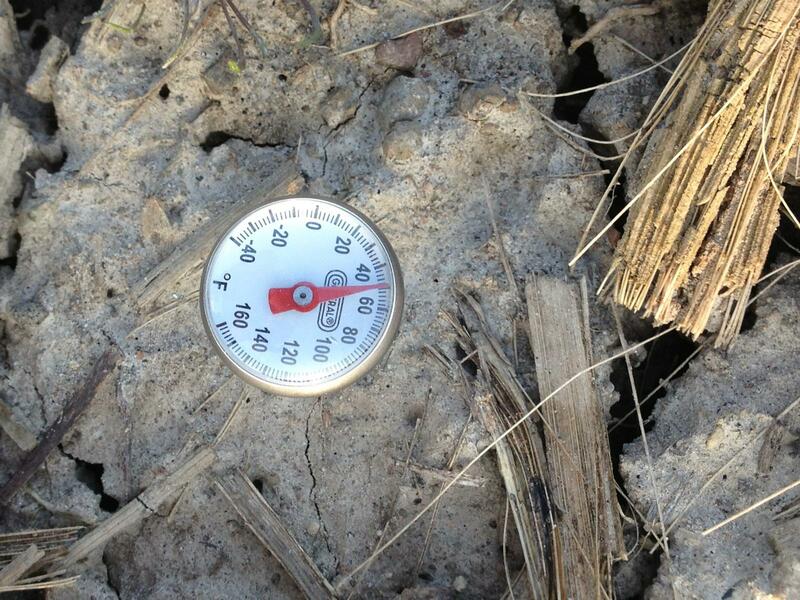 On Friday April 5, 2013 my brother Don recorded the temperatures in soils on our home farm near Greenwood, IN (central Indiana). The previous week Don took soil temperatures coming out of a colder than normal March. The results showed very similar temperatures in soils at approximately 4″ deep in fall tilled soil, long term no-till soil, and soil covered with an annual ryegrass cover crop. The first week of April saw chilly day and nighttime temperatures in the area. The average daytime temperature was 53.5 degrees (normal is 58.71 degrees) and the nighttime temperatures were 30.8 (average 38.29 degrees). 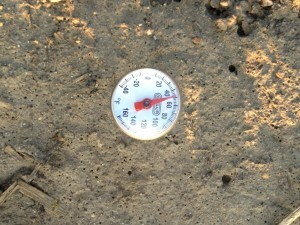 The soil temperatures gained a few degrees in each area. While the soils are not warm enough to plant corn in yet they are getting closer. No one in the area has started any planting yet but the soil temperature readings show that all of the soils tested are getting close to being warm enough to make sure the planter is ready and seed is in the shed ready to go to the fields. Don told me that he heard from Barry Fisher at a recent cover crop field day that soil biology starts becoming active at around 38 degrees soil temperature. Each of the soils are well above that temperature. During the next testing session Don will also be testing for soil moisture and taking some earthworm counts in each of the soils. 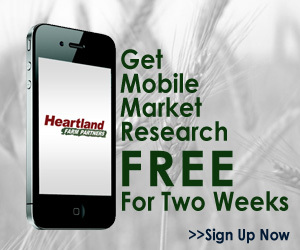 ← Do Cover Crops Keep the Soil Colder in the Spring? 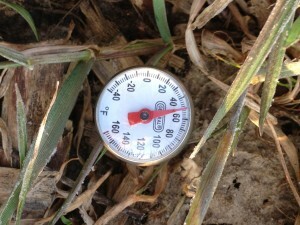 2 Responses to Part 2- Do Cover Crops Keep the Soil Colder in the Spring? Soil temp 47 degrees here today (north east Indiana). Hi Chuck! Was that in cover crop ground or your no-till ground?